These bars and restaurants know what they’re doing. By Wednesday, many of us are eyeing the weekend, ready for a delicious glass of wine. And what’s this? Plenty of North County spots ready to serve and help you over the hump that is midweek. Here are some places to visit if you’re waving (craving wine). Please note we included establishments with a nice wine selection and in some cases, worth-mentioning specials on nights other than Wednesday. Use the filters to find the perfect Wine Wednesday spot near you. An elegant yet casual vibe (it can happen!) makes this a stand-out in Carmel Valley’s Highlands center. With an enormous wine list, farm-to-table California menu and a cool crowd, Dolce is the place to be on Wine Wednesday, when they offer half-off bottles of wine. This little bar/restaurant on Camino Del Mar offers nice patio seating and a cozy bar area for intimate after-work drinks. Super casual with a locals-only flair, Zel’s welcomes everyone with its bistro food, full drink menu and warm atmosphere. Even better, Zel’s offers bottles of wine at half-price (with the exception of sparkling wines) on Wednesdays that pair well with the tasty bar vittles. What goes perfectly with Parisian crepes and Italian paninis? How about wine offered on the same menu with tastings and one of the most eclectic wine lists in San Diego County. Enjoy this bistro and wine bar’s outdoor patio or shop from their discount wine room and sample your new purchase at home or right there at their quaint location. Feel free to test your Italian if you happen to run into the Chef and owner, Nicolo Becucci, who speaks five languages and brings authentic cuisine to the table. Crepes’ does its special wine night on Tuesdays with half-price selected bottles of wine from 5 PM to close. Here’s another Tuesday wine night – this one at Sbicca, located in the heart of Del Mar. Featuring a nicely curated wine list, Sbicca’s wines are half-off Tuesdays and Thursdays. Recognized by Wine Spectator’s “Award of Excellence” and the 2013 Gold Medallion Recipient for the best neighborhood restaurant, Sbicca features a cozy atmosphere, patio dining, and menu full of shareable dishes. The modern Asian cuisine restaurant offers $8 off select bottles of wine on Wednesdays from 4-8:30 PM. They claim their Wine Spectator award-winning wine list offers the best pricing in San Diego. That sounds like a challenge! You better order some wine and find out for sure. Named one of America’s 50 best Italian restaurants, Davanti Enoteca is located across from the luxury movie theater, Cinépolis, and is a fun, high-energy place serving inventive menu items and cocktails. Of course, this is about wine, and the location is a fun place to people watch and choose something from the nicely curated wine list when the bottles are half-price during Davanti’s Wine Wednesdays. With a spacious patio right on the beach, Poseidon is a local favorite for happy hour, maybe because they offer half-off bottles of wine every Tuesday and Wednesday. Come to think of it, Poseidon’s popularity is due more likely because of the beach-in-your-face location, but the wine’s good too. Wine Steals offers wine tastings for $5 every Wednesday from 5:30 to 7:30 pm (last tasting sold at 7 PM). Every tasting is themed and super casual. 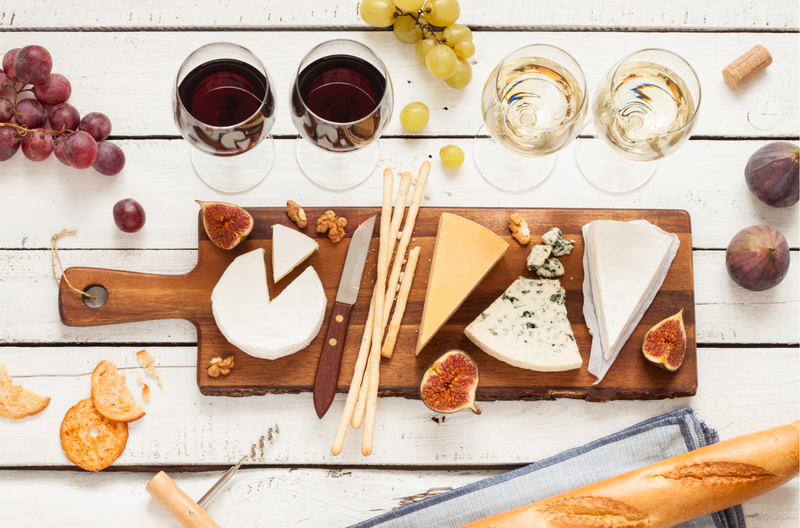 Grab your tastings, browse Wine Steals’s amazing menu of cheese boards, pizzas, plates of pasta, and salads and celebrate midweek in delicious style. Located in the Sheraton Carlsbad, Twenty/20 puts on its half-off wine promotion every Wednesday. Grab a Twenty/20 select bottle of wine – the selections rotate every week – for lunch and/or dinner at 50% off. Diners must purchase one entree per table to qualify for the half-priced bottle offer; good from 11AM-10PM. Located at the Forum Carlsbad, The Wine Loft offers a variety of tasting events featuring a winery, winemaker or great value wines. They also have an online store and happy hour on Mondays and Thursdays from 4-6PM with half-priced glasses of wine. Fans of Italian wines are in luck at family-owned and operated Fresco on Wednesday. The entire extensive selection is half-price and also includes California and international favorites. The restaurant is known for its authentic Italian food and ambiance, which complements the wines nicely. Not up for a whole bottle? Visit during happy hour for $5 wines by the glass from 4:30-6:30 PM. This Italian restaurant in 4S Ranch boasts a happening after-dinner bar scene. Live music, shareable appetizers, and a fantastic wine list bring the folks for happy hour and beyond. Go any night for fun, but definitely drop by Monday and Tuesday nights for half-off bottles of wine. Both Crust Pizzeria locations feature half-priced bottles of wine on Wednesdays. And before you say that a pizza place can’t possibly have a good wine menu, check it out first. You’ll be surprised. There’s also New York-style pizza, so put that in your mouth, too. Yanni’s wine list runs several pages with a well-curated balance between old and new world wines. Confused? Descriptors like “Old World Greece” and “Chardonnay Oaked” will help direct you. Servers also help find the perfect beverage fit for your meal and may even recommend hard-to-find or vintage wines from Yanni’s personal cellar. Happy hour wines delight and often feature little-known but exceptional wines opened for availability by the glass. Order something wonderful from the Greek-Italian menu and take a seat in the open dining room. If you dine outside, enjoy large patio areas with heat lamps (try the table with the built-in fire pit). Although Yanni’s doesn’t offer a Wine Wednesday, the restaurant is included here because it’s happy hour wines consistently impress. Get a glass of white for $5 or a red for $6 every day but Sunday from 3-6PM. On Sunday, that special is good from noon to 8 PM. Sit on the patio or on one of the lounge couches (if you can snag one) and enjoy a nice glass of something mellow. The Barrel Room’s wine list features more than 250 bottles of wine and has won awards from Wine Spectator, Wine Enthusiast, and the San Diego Union-Tribune for its selections. Starting October 2, swing by the Barrel Room’s newly designed happy hour from 2:30-5:30 PM Sunday through Thursday, and try a glass of wine from the list. Expect weekly rotating red, white, and rosé specials for $7 a glass or less. You can also try one of The Barrel Room’s creatively named wine flights (think “What the Blanc?”) for $9. Not too long ago, the Cohn Restaurant Group’s sommelier, Maurice DiMarino, founded the Prime Cru wine club where members (note: it’s free to join) receive wine discounts and special event invitations. You can enjoy these wines and events in person when you stop by Vintana’s lanai on Wednesdays from 6PM-9PM. Listen to live music while you taste and enjoy Prime Cru’s discounted prices and waived corkage fees on your purchases. This upscale New French eatery in old Escondido boasts a popular and vast wine menu. Not surprisingly, Vincent’s wine list has won Wine Spectator recognition for several consecutive years. Vincent’s Private Cellar wines are also available and feature limited production wines highly sought after by wine enthusiasts. If you visit on a Wednesday, it’s Nuit de Vine (Night of Wine) when all wines (excluding private cellar) are half off the listed price. Although VINZ is indeed a restaurant and wine bar, its Wine Wednesday caters to the dogs. That’s right. Every Wednesday from 3 PM to close, VINZ hosts Whine Bar Dog Night, where people who bring their pets and sit on the patio enjoy $22 bottles of wine, $5 and $6 wines by the glass, and full access to the Happiest Hour food menu for the day. Dogs get half-off puppy pizza, naturally. Check out this Wine Wednesday: the Brig offers half-off bottles of all its wines – even the $100+ bottles – all day and all night on Wednesdays. Get discounted apps too, from 4-6PM. But let’s face it, you’re going for the wine. Taste wines from around the world at this low-key, fun spot across from Restaurant Row in San Marcos. Nearly every night there’s something going on from a happy hour to half-off night. On Wednesdays, expect something cool, too, when from 4-9PM, North County Wine Company owners offer special wine events. As the website tells you, it might be a tasting, it might be a flight of half glasses, or it might be something else. Whatever it is, the lineup changes every week so sounds like a must visit.